Raul Burbano of Common Frontiers discusses Canada's support of the post-coup government in Honduras, including the horrific situation faced by Indigenous people and others who opposed the government. 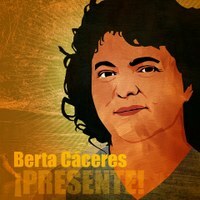 May 20, 2016 -- This episode is an Interview with Raul Burbano of Common Frontiers on the group's role in researching and exposing Canada's ongoing role in supporting the post-coup governments in Honduras, including the horrific situation faced by Indigenous people and others opposed to the government's environmental, economic, and social policies. Raul discusses the ongoing resistance of people in Honduras, including many Indigenous communities to the corrupt post-coup governments despite being violently repressed, including the March 2016 targeted assassinations of Berta Cáceras and Nelson Noé García Laínez from the Civic Council of Popular and Indigenous Organizations of Honduras (COPINH). More than 100 environmental, labour, and social justice activists have been similarly murdered since the coup. We also discuss the 2013 free trade agreement between Canada and the Honduran government, and how the "soft coup" has become an increasingly used tactic of the neo-liberal capitalists, as is being witnessed this week in Brazil with the right-wing action to impeach the centre-left president and replace the cabinet with an all-white, all-male conglomeration of conservatives. Raul encourages those in Toronto to join the Sunday May 15th 1pm demo at the Consulate General of Brazil. Raul also outlines the work of Common Frontiers, including a 2013 delegation to Honduras which witnessed wide-scale inconsistencies in the elections (which were widely boycotted) as well as a recent delegation to the country which went to observe the human rights situation. The other trade deal that Raul discussed in our interview was the Trans Pacific Partnership (TPP). Like the trade deal made in Honduras, the TPP will restrict the ability of the public to enforce environmental and social standards by allowing companies to sue governments who create rules that might hinder their profits. Complaints in these trade deals will be dealt with in secretive corporate led tribunals, beyond the reach of national judicial systems. Raul highlighted that the TPP is not yet ratified, and that the Trudeau government is now undertaking limited public consultation on the TPP. He encouraged people to let their MP's know that the TPP is not in the best interests of people here in Canada, nor is it for the inhabitants of any of the 10 other countries involved in these secretive dealings. Liam Rivera (@LiamMusica) - Homenaje a Berta Caceres. Simon Rios (@simonfrios) - Golpe. Karla Lara - Que corra el río (Río Gualcarque. The anthem of the resistance after the coup called: Nos tienen miedo porque no tenemos miedo. Karla Lara - They Kill Us For Being Women.